El periodista y músico Felix Contreras escribió esta semana un artículo referido a los diseños de congas que inventara nada menos que el legendario actor Marlon Brando. No es un secreto la gran afición que Brando tenía por la música cubana. En tal sentido, Contreras se reunió con “El Conguero” Poncho Sánchez, el abogado Kevin Constanza y el representante del legado del actor, Avra Douglas, para conversar sobre aquellos diseños de los que su existencia, hasta no hace mucho, eran una "leyenda urbana". En la foto, Constanza y Poncho examinan uno de las congas que Brando diseñó y que se encuentran en un almacén del este de Los Angeles. Actor Marlon Brando was an Afro-Cuban drumming enthusiast, as well as an inventor whose lost prototypes became the stuff of urban legend. In a nondescript storage facility in West Los Angeles sits a little-known bit of Hollywood history. It concerns the late legendary actor Marlon Brando, but it's not about any of his stage or screen roles. Behind its roll-up door sits a collection of items from the very public life of Brando — the actor. Among them are a marked-up script for the film Mutiny on the Bounty and a large box of letters from Frank Sinatra and other admirers. There is also a peek into the life of Brando the inventor. 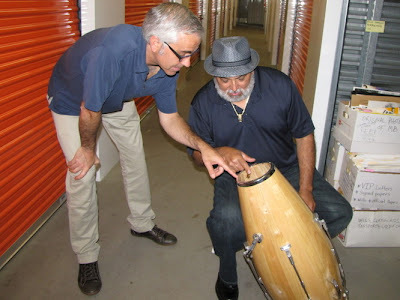 I visited the facility with Grammy-winning Latin jazz percussionist Poncho Sanchez, patent attorney Kevin Costanza and Brando estate executor Avra Douglas to dust off Brando's patented invention for tuning conga drums. The Oscar-winning actor was also an amateur drummer and an inventor with four patents to his credit. Costanza says Brando was a regular reader of Scientific American magazine and had a seemingly endless stream of ideas. "He had these shoes that you can wear in the pool, that would increase friction as you walk on the bottom of the pool to give you a better workout," Costanza says. "He was fascinated by the geodesic dome, always talking about ways to build things using the geodesic dome." Through assistants, Brando contacted Costanza and hired him to work on the drum-tuning design. But Brando's people laid down some very strict rules before any conversations could begin. "He doesn't want to be called an actor, he doesn't want to know he's your favorite actor, he doesn't want to know how much you loved his movies. He doesn't want to talk about acting or Oscars or any of those kinds of things," Coztanza says. "He was an inventor, hiring a patent attorney to get him patents for his drum invention." Brando spent more than five years working with Costanza on schematic drawings. Production designer Jack Connor made custom drum parts. Then, in 2002, Brando was awarded the first of four patents for various parts of his design. Brando's system would have replaced the five or six bolts around the head of the conga with a linkage system connected to a single tuning lever. But Brando died in 2004, and efforts at licensing the design to manufacturers came to a halt. The design became something of an urban legend among Latin percussionists: "It's a pretty far-out invention," Sanchez says. He originally met Brando in the late 1970s. 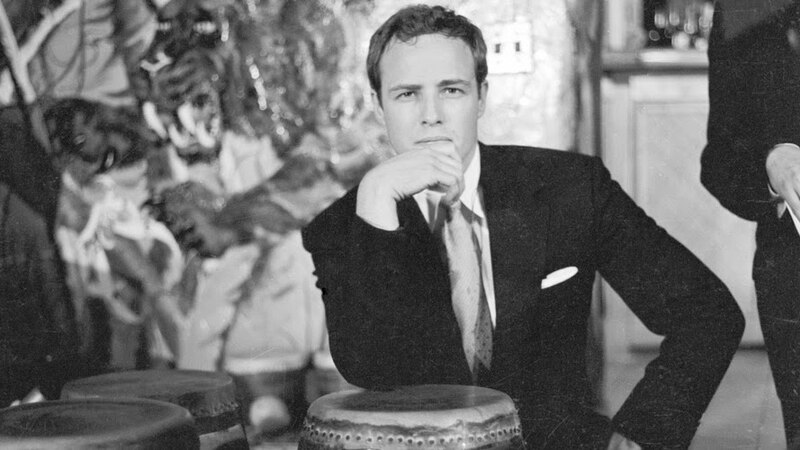 Then, almost two decades later, Brando called him to seek advice on the invention. The two spoke on the phone frequently. "It was outrageous at first," Sanchez says. "I would be out on the road, and my wife would say, 'Marlon Brando called you today.' "
All three prototype drums made for the patent applications were thought to be lost, until Costanza tracked one down in this storage facility. He was anxious to see the design in action, and Sanchez was eager to finally test it out. Inside the storage room, Costanza turned the crank on the side of the drum connected to the linkage inside, while Sanchez tested the tone. Soon, the drum was ready for a test drive. Brando's invention attempted to improve on a design that has been in place for more than six decades. Ultimately, there were no takers. A representative for a drum manufacturer that considered marketing the design told me he thought the idea was practical, but not very cost-effective. He said he'd been reluctant to tell the actor, joking that he was afraid of an offer he couldn't refuse. In light of Brando's frustrations with production delays and his own failing health toward the end of his life, estate executor Douglas says, the actor would have been more than pleased to hear that his invention had been rediscovered. "I know he was very excited about it," Douglas says. "He had really high hopes, he was passionate about it, and he would have been thrilled to see Poncho playing it." For now, the drum will go back into storage. Douglas says there are no plans to do anything with the design, other than let it rest with other mementos of a very full life.